Apple's A12 kernelcaches, aside from being "1469"-style (monolithic and stripped), also have additional segments marked PPL. These pertain to a new memory protection mechanism introduced in those chips - of clear importance to system security (and, conversely, JailBreaking). Yet up till now there is scarcely any mention of what PPL is, and/or what it does. I cover pmap and PPL in the upcoming Volume II, but seeing as it's taking me a while, and I haven't written any articles in just about a year (and fresh off binge watching the article's title inspiration :-) I figured that some detail in how to reverse engineer PPL would be of benefit to my readers. So here goes. You might want to grab a copy of the iPhone 11 (whichever variant, doesn't matter) iOS 12 kernelcache before reading this, since this is basically a step by step tutorial. Since I'm using jtool2, you probably want to grab the nightly build so you can follow along. This also makes for an informal jtool2 tutorial, because anyone not reading the WhatsNew.txt might not be aware of the really powerful features I put into it. __PPLTEXT.__text: The code of the PPL layer. The separation of PPLDATA from PPLDATA_CONST.__const is similar to the kernelcache using __DATA and __DATA_CONST, so KTRR can kick in and protect the constant data from being patched. The PPLTRAMP hints that there is a special code path which must be taken in order for PPL to be active. Presumably, the chip can detect those "well known" segment names and ensure PPL code isn't just invoked arbitrarily somewhere else in kernel space. The few functions we do not have, can be figured out by the context of calling them from the non-PPL pmap_* wrappers. But we still don't know how we get into PPL. Let's go to the __TEXT_EXEC.__text then. The kernel's __TEXT_EXEC.__text is already pretty large, but adding all the Kext code into it makes it darn huge. AAPL has also stripped the kernel clean in 1469 kernelcaches - but not before leaving a farewell present in iOS 12 β 1 - a fully symbolicated (86,000+) kernel. Don't bother looking for that IPSW - In an unusual admittal of mistake this is the only beta IPSW in history that has been eradicated. Thankfully, researchers were on to this "move to help researchers", and grabbed a copy when they still could. I did the same, and based jtool2's kernel cache analysis on it. This is the tool formerly known as joker - which, if you're still using - forget about. I no longer maintain that, because now it's built into jtool2, xn00p (my kernel debugger) and soon QiLin - as fully self contained and portable library code. So, again, a check for > 68, on which we'd panic (and we know this function is ppl_dispatch!). Otherwise, a switch style jump (BLRAA X10 = Branch and Link Authenticated with Key A) to 0xfffffff0077c1f20 - the table we just discussed above. We start by reading the DAIF, which is the set of SPSR flags holding interrupt state. We then block all interrupts. Next, a load of a rather odd value into S3_4_C15_C2_1, which jtool2 (unlike *cough* certain Rubenesque disassemblers) can correctly identify as a special register - ARM64_REG_APRR_EL1. An Instruction Sync Barrier (ISB) follows, and then a check is made that the setting of the register "stuck". If it didn't, or if X15 is over 68 - we go to fffffff008f5c0d8. And you know where that's going, since X15 greater than 68 is an invalid operation. The register will be set to another odd value (6477), and then a check will be performed on X15, which won't pass, since we know it was set to 2 back in fffffff008f5c0d8. X10, if you look back, holds the DAIF, because it was moved from X20 (holding the DAIF from back in fffffff008f5bfe0), where X15 was set. This is corroborated by the TST/B.EQ which jump to clear the corresponding DAIF_.. flags. # eventually make it to jtool2. I just have other things to handle first..
0xfffffff008f85430: 73 2F 73 74 61 74 65 00    s/state. So what are the references to S3_4_C15_C2_1, a.k.a ARM64_REG_APRR_EL1 ? The following disassembly offers a clue. We see that the value of the register is read into X0, and compared to 0x4455445464666477. If it doesn't match, a call is made to ..fffffff0079e3e10, which checks the value of our global at 0xfffffff008f70070. If it's 0, we move elsewhere. Otherwise, we check that the register value is 0x4455445564666677 - and if not, we hang (fffffff0079e3e34 branches to itself on not equal). In other words, the value of the 0xfffffff008f70070 global correlates with 0x4455445564666477 and 4455445564666677 (I know, confusing, blame AAPL, not me) in ARM64_REG_APRR_EL1 - implying that the register provides the hardware level lockdown, whereas the global tracks the state. We see what appears to be three distinct structs here, identified as "ans2_sart", "t8020dart" and "nvme_ppl". (DART = Device Address Resolution Table). There are also six function pointers in each, and (right after the structure name) what appears to be three fields - two 16-bit shorts (0x0003, 0x0001) and some magic (0xdeaddab7). which we can then apply to the NVMe and T8020DART. Note these look exactly like the ppl_map_iommu_ioctl* symbols we could obtain from the __TEXT.__cstring, with two unknowns remaining, possibly for allocating and freeing memory. It's safe to assume, then, that the corresponding functions are "...art_get_struct" or something, so I added them to jokerlib as well, though I couldn't off hand find any references to these getters. Most people will just run jtool2 --analyze on the kernelcache, then take the symbols and upload them to IDA. This writeup shows you the behind-the-scenes of the analysis, as well as explains the various PPL facility services. PPL Protected pages are marked using otherwise unused PTE bits (#59 - PPL, #60 - executable). PPL likely extends to IOMMU/T8020 DART and the NVMe (to foil Ramtin Amin style attacks, no doubt). The special APRR register locks down at the hardware level, similar to KTRR's special registers. Why AAPL chose these values, I have no idea (DUDU? Dah Dah?). But TURNS OUT The values are just permissions! r--r--r-xr-x... etc. Thanks, @S1guza! Checking for the magic (by MRSing) will tell you if the system is PPL locked down or not. For those of you who use IDA, get them to update their special registers already. And add jtool2's/disarm's :-). The APRR_EL1 is S3_4_C15_C2_1. There's APRR_EL0 (S3_4_C15_C2_0) and some mask register in S3_4_C15_C2_6. There may be more. To get these (~150) PPL symbols yourself, on any kernelcache.release.iphone11, simply use the jtool2 binary, and export PPL=1. This is a special build for this article - in the next nightly this will be default. 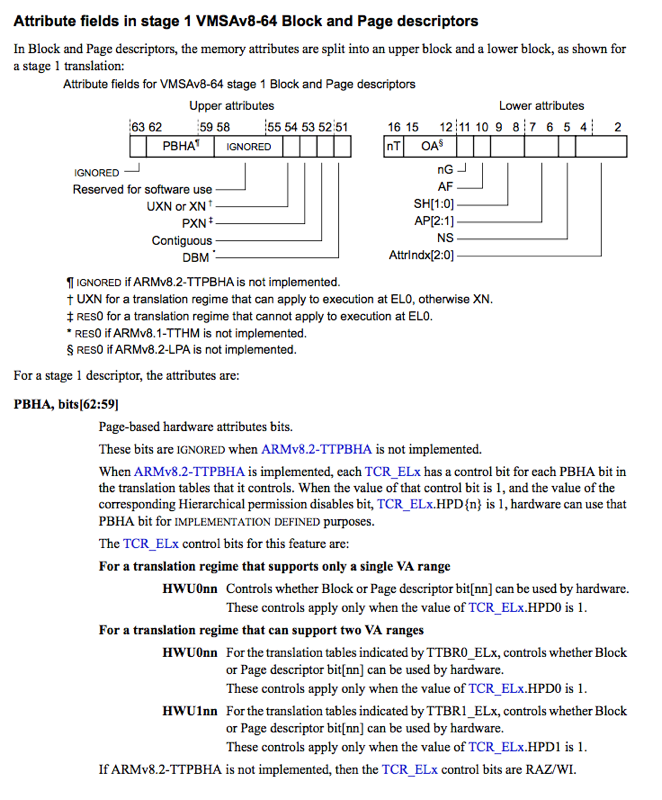 @S1guza - for a thorough review of the article, and reading the ARM64 specs like few have or ever will. Luca - for reviewing and redacting the reason why the article's namesake applies in more than one way :-).. and pointing out he gave a talk on this at Tensec and BlueHat.il which is well worth reading.